Following Seattle Opera’s final performance of The Barber of Seville on Saturday night, the Italian language leaves our theater for a while. We won’t present an Italian opera again until January of 2012, when Verdi’s Attila comes to Seattle Opera for the first time. (We’ll be singing in French, German, and English before then.) Coming up next--beginning rehearsal tomorrow, in fact--is Don Quichotte, a French opera based on a Spanish story, and featuring an exciting international cast. Also in the cast are Seattle natives Alex Mansoori and Marcus Shelton, both alumni of Seattle Opera’s Young Artists Program and both making mainstage debuts in these performances, Seattleites Emily Clubb and Jen Bromagen, and native French-speaking Seattle actor Jad Kassouf, just back from Paris. The only person who’s doesn’t get here immediately, Ernesto told me, is American baritone Richard Bernstein, who plays Cavallier’s Sancho Panza. If you want to know why Bernstein is coming late, tune in to the Metropolitan Opera’s live broadcast of Simon Boccanegra on Saturday (10 am on Classic KING-FM, 98.1) and listen for his unctuous Pietro. Although Ernesto is a big fan of Italian and French opera, he’s a native Cuban, and he’s most excited about this opera because of the story’s Spanish origin. “Cervantes’ Don Quixote is one of the great books in any language,” Ernesto told me, “And in every Spanish-speaking country, everybody has been exposed to Don Quixote, every household has a copy of the book. It makes no difference where you’ve been educated or even if you’ve been educated--everyone knows these characters. I remember how my father, who loved to read, when I was a boy on Sundays he often went into his room and read a chapter of Don Quixote, sometimes laughing so loud that we all wanted to know what it was. 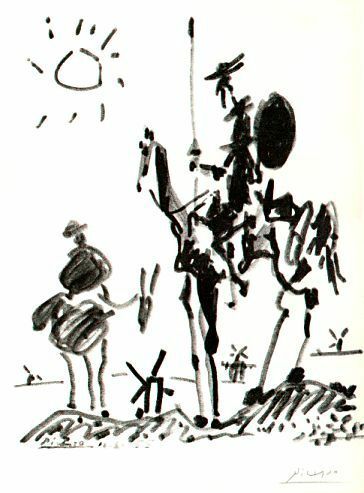 I was only 5, 6, 7 years old, so I didn’t always understand what was so funny at the time, but I’ll never forget how much he loved the book.” Ernesto started reading Don Quixote as a teenager. I remember the book’s warmth and hilarity pulling me through the long, dark winter of my freshman year in college. We couldn’t be more excited to get started on this opera tomorrow. long opera-lover/-goer as a result!! !